Obama, Boehner looking to regroup after a disappointing spring and summer… McConnell is simply looking to survive… Hillary delivers speech on voting rights… Weiner’s big tell about Hillary and 2016… Booker the disruptor… If the Newark mayor joins the Senate in October, expect his early exposure to resemble Ted Cruz’s rather than Clinton’s, Obama’s, and Rubio’s after they were first elected. *** Obama, Boehner looking to regroup: With President Obama on Martha’s Vineyard and with House Speaker John Boehner on Congress’ August recess, the summer doldrums give them plenty of time and space to ponder this question: What do they do after a disappointing spring and summer? Obama is still searching for a notable second-term legislative achievement -- something that Ronald Reagan accomplished (tax reform), but that Bill Clinton and George W. Bush didn’t. Obama struck out on gun control after the Newtown shootings; immigration reform has hit a brick wall in the U.S. House; and the budget talks still aren’t going anywhere. Meanwhile, Boehner is struggling to show that his GOP-led House can govern. The latest example came late last month, when House Republicans pulled an appropriations bill to fund the Transportation and HUD departments because they didn’t have the votes. Strikingly, Obama’s and Boehner’s desires could converge -- Obama wants a second-term achievement, Boehner needs something to show he and his colleagues can govern. 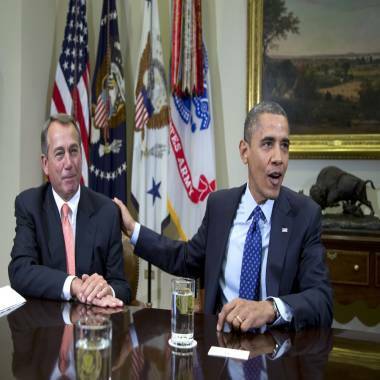 Even so, they couldn’t seem farther apart right now on immigration and the budget. President Barack Obama acknowledges House Speaker John Boehner of Ohio while speaking to reporters in the Roosevelt Room of the White House in Washington, Friday, Nov. 16, 2012, as he hosted a meeting of the bipartisan, bicameral leadership of Congress to discuss the deficit and economy. *** McConnell is looking to survive: If Obama and Boehner are looking to regroup, Senate Minority Leader Mitch McConnell is simply looking to survive after a rough July -- when he got both primary and general-election challengers and when his Senate GOP colleagues began to rebel on filibustering the president’s executive-branch appointments. And given the primary challenge, McConnell’s top goal over the next year is protecting his right flank. “Ahead of fall fiscal talks that already have Washington nervous about a government shutdown, Senate Minority Leader Mitch McConnell is clamping down on Republicans with a firm message to stick with him on spending,” Politico recently wrote. “The GOP leader sees a winning political message heading into the fall before the 2014 midterms. Showing himself as the leader of a conference bent on spending cuts as he runs for reelection in conservative Kentucky won’t hurt either.” So even if Obama’s and Boehner’s interests align, McConnell’s interests won’t. Then again, there are enough GOP senators who could work with Democrats to get 60 votes. Meanwhile, McConnell has a new web video hitting GOP primary opponent Matt Bevin. In a speech at the American Bar Association, Hillary Clinton says that there is a new effort to obstruct voting "often undercover of addressing a phantom epidemic of election fraud" and takes issue with the Supreme Court's recent Voting Rights Act ruling. *** Hillary delivers speech on voting rights: In her remarks yesterday to the American Bar Association in San Francisco, former Secretary of State Hillary Clinton focused on an issue that has become near and dear to many Democrats -- voting rights, especially for minorities. Clinton criticized a "sweeping effort to construct new obstacles to voting, often under cover of addressing a phantom epidemic of 'election fraud,’” NBC’s Mike O’Brien notes. Clinton added, "Now, not every obstacle is related to race, but anyone who says that racial discrimination is no longer a problem in American elections must not be paying attention.” Clinton also said that she would be delivering future speeches -- next month on transparency with national-security programs, and this fall on global issues. So if you thought that Clinton would be stepping away from the public stage months after leaving her post as secretary of state, think again. *** Weiner’s big tell about Hillary and 2016: And embattled New York mayoral candidate Anthony Weiner appeared to confirm what everyone assumes Hillary Clinton will be doing in 2015-2016. “Do you know what [wife Huma Abedin’s] role in Hillary’s 2016 campaign is going to be?” Buzzfeed’s Ben Smith asked Weiner in an interview last night. “I do,” Weiner answered.” “And what will it be?” Smith followed up.” Said Weiner: “I’m not telling you.” Speaking of Weiner, the Democratic New York mayoral candidates square off in their first major broadcast debate beginning at 7:00 pm ET. In an interview with NBC's Kasie Hunt, New Jersey Senate contender and Newark Mayor Cory Booker addresses the recent reports about his campaign finances and defends his role in an Internet startup company. *** Booker the disruptor: Today is the special Senate primary in New Jersey, where Newark Mayor Cory Booker, Reps. Frank Pallone and Rush Holt, and Assembly Speaker Sheila Oliver are battling for the Democratic nomination. On the Republican side, the candidates are conservative activist Steve Lonegan and physician Alieta Eck. With Booker the big favorite in today’s primary -- as well as the Oct. 16 general election -- we again ask the question we raised last week: What kind of senator would the 44-year-old Booker be? Our educated guess: He would be a disruptor, in ways that could be interpreted as both good and bad, depending on your view of the U.S. Senate. You would see him partner with someone like Rand Paul on legislation; you would see him alienate some of the old bulls, both Democrats and Republicans (just like he alienated Lautenberg when he started to eye the seat before the incumbent said he wouldn’t run for re-election); and you would see him become the first true social-media senator (with his 1.4 million Twitter followers). *** More Ted Cruz than Clinton, Obama, or Rubio? So you could have a disruptive force in one of the government’s most orderly and decorous bodies. "My focus is winning an election tomorrow, god willing, and winning a general and then going down to Washington to give New Jerseyans what they deserve: a hands on, pragmatic, change agent in Washington and in New Jersey, and that's what I look forward to being," Booker told NBC’s Kasie Hunt yesterday. That’s similar to how Sen. Ted Cruz (R-TX) has viewed his first few months in the Senate -- as someone who wants to shake things up, early and often. And that’s different from how other big names (think Hillary Clinton, Barack Obama, Al Franken, Marco Rubio) initially approached their jobs in the Senate. That’s not how Booker ticks. Polls in New Jersey opened at 6:00 am and close at 8:00 pm.